Guys have said that I am lucky to test all of these beard care products, it does however have its ups and downs, but it is with products like this that I really appreciate what I do! 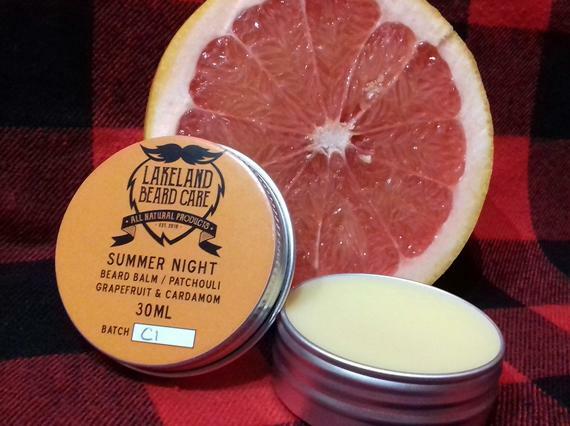 The Lakeland Beard Care Summer Night beard balm has the most beautiful scent! Now these brand owners need to stop doing this, I keep getting sent amazing products and so it must look like I am not judging these products properly! The scent for the Summer Night balm is Patchouli, White Grapefruit & Cardamom and wow what a scent it is! The freshness of the White Grapefruit scent sits perfectly with the mildly spicy Cardamom and the strong, slightly sweet and intoxicating Patchouli. This scent is in a base of Beeswax, Cocoa Seed Butter, Sweet Almond Oil, Argan Oil & Jojoba Seed oil. The result is a creamy coloured smooth balm with a medium consistency and it is a very nice balm. It left my beard feeling softer, gave a nice hold and of course it will help to keep the skin under my beard in good condition. The Lakeland Beard Care Summer Night Beard Balm comes in a 30ml screw top tin and costs £9.99 from their Etsy shop.